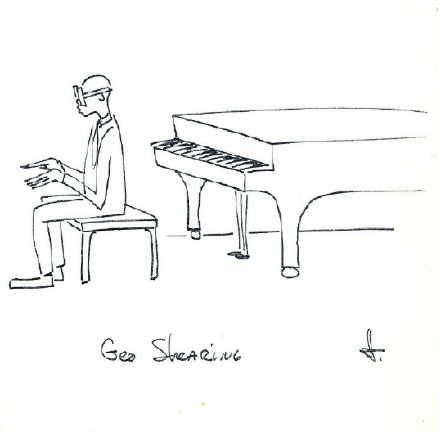 David Sherr’s comment on the Jimmy Rowles drawing of Art Tatum in the post below included mention of Rowles’s George Shearing drawing. He offered to share it, but it is not possible to include pictures with comments as it is in posts by the Rifftides staff, so here’s a new exhibit of Jimmy’s wit, wisdom and sketch ability. Thanks to David Sherr, Charlie Shoemake and Bill Crow, all of whom submitted the drawing from their collections. Pictured left, Sir George being knighted by Queen Elizabeth at Buckingham Palace in 2007 and below, portrayed by Rowles, one of his biggest fans. While we’re at it, why not listen to Rowles? Here he is with one of his favorite duet partners, Al Cohn, on tenor saxophone, from their increasingly rare 1977 album Heavy Love. I really dig Rowles, as well as the simple truth-essential drawing of Shearing. Rowles is one of my favorites. Thanks! Also, I like the new web design. Thanks for giving Jimmy Rowles his due. I had heard him accompanying singers on various albums, without registering him much, but became a big fan after Stan Getz released a record “featuring Jimmy Rowles.” If I’m not mistaken, Diana Krall studied with Rowles and I think you can occasionally hear his echoes in her playing and singing. Thanks for the Al Cohn/Rowles track. I forgot they recorded a few times, but they were great together, much like the Rowles/Sims pairing. I’m going to have to pick this one up. Diana Krall talks about her studies with Jimmy Rowles in my profile of her in my Living the Jazz Life (Oxford U Press, 2000), page 132. He taught me about Duke Ellington and, mostly, about beauty in music.